Behind any successful industry, there are talented people. The automotive industry recognises the value of its employees, something reflected in the report’s materiality assessment (see page 30 of the report) as one of the most significant aspects of the sector’s operations. The industry is committed to nurturing talent and investing in the education and training of all of its employees, increasing retention while also helping to develop the workforce of tomorrow. This is essential to addressing skills shortages, working to close the industry’s gender gap and tackling demographic trends such as an ageing workforce. The industry also strives to be an inclusive employer, welcoming all genders and ages. Despite the decline in manufacturing output, the number of employees reported by signatories in 2017 increased by 7.5% to 113,500. Agency workers accounted for 17.4% in total employment, a drop of a percentage point on the previous year. This uplift reflects industry gearing up for planned increases in output ahead of new model launches. The number of jobs dependent on the automotive sector in the UK increased to 856,000, with direct employment in automotive manufacturing jobs growing by 2.8% to 186,000. The number of women employed by the signatories increased from 10.1% in 2016 to 12% in 2017. Women accounted for 14.1% of engineers in the automotive sector and 11% of the overall engineering workforce. This year, we introduced a new metric to analyse the age profile of new employees. According to the feedback from 17 signatories, 34.7% of new intake was below 30 years of age, 51.5% was 30-50 and 13.8% above 50. From 5 April 2018, all employers with legal entities in the UK that employ 250 or more employees are legally required to report the gender pay and bonus gaps for their organisation. According to the Office of National Statistics, on average in 2017, men in the UK workforce and manufacturing overall were paid 18.4% and 20.8% more than women respectively, based on median hourly earnings. The gender pay gap in UK automotive manufacturing (including SMEs) is close to the national average but better than in manufacturing overall, with men paid 18.9% more than women. However, the gender pay gap for 24 signatories to this report covered by the obligation was a more modest 4.9% (median). The gender pay gap for all engineering professionals was 4.4% in favour of men. In the mechanical engineering discipline, which is likely to be where most of those working for the automotive industry are captured, women were paid 6.1% more than men. 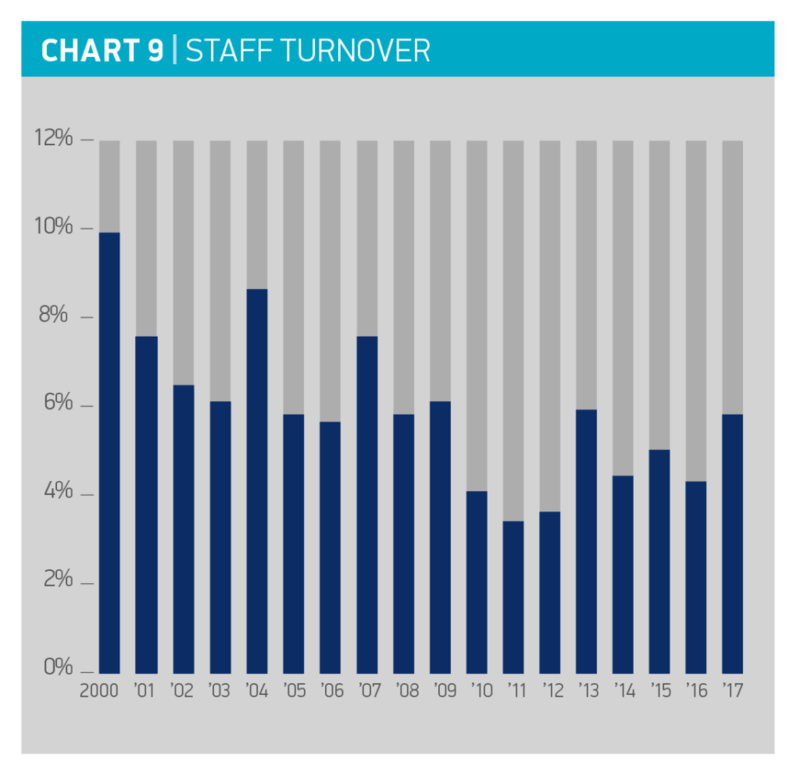 In 2017, staff turnover increased to 5.8% from 4.3% in the previous year. Employees’ satisfaction with remuneration and the working environment is reflected in the overall relatively consistent staff turnover trend.